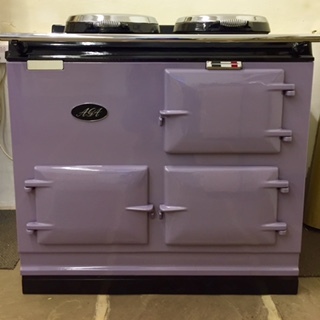 Currently we are able to offer 2 types of electric AGA, ensuring that all requirements are met. The 2 different types are detailed below and can be viewed in working order in our showroom. For any further information, please do not hesitate to contact the office or Martin direct. 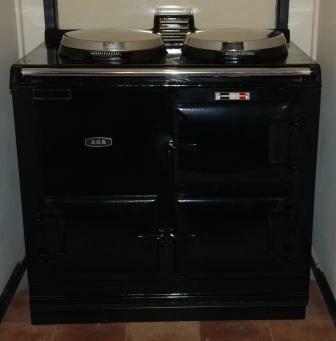 This type of electric AGA looks and functions like a conventionally fuelled AGA, with a single heat source (in this case, an electric element) heating the cast iron components to ensure perfect cooking everytime. It is powered by a single 13amp supply and does not need to be vented to outside, enabling the owner to site it wherever they choose. As there is no flue for heat to escape from and the clever recirculation system inside, this AGA uses the generated heat to best effect, keeping running costs down and maintaining ideal cooking conditions. 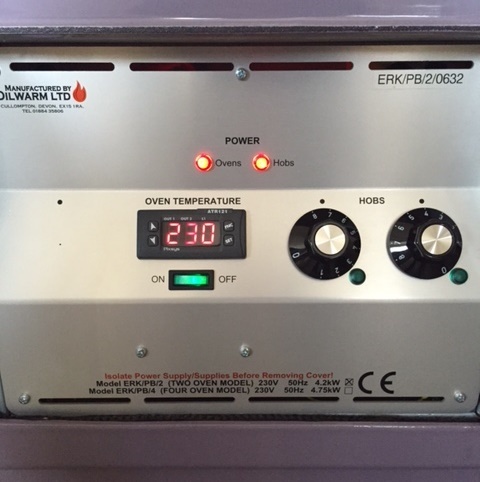 The AGA is adjusted via a control box which will sit externally to either the left or right of the AGA. If you have cupboards directly adjacent to the AGA, this control panel can be placed within the cupboard. 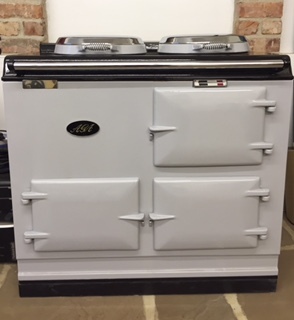 This AGA allows you to experience the traditional AGA way of cooking whilst minimising costs through the use of electric rather than oil or gas. The Electrickit AGA allows you to have the traditional AGA look, with the ease of use of a normal electric oven. Its revolutionary design uses separate elements to heat the 2 hobs and the top oven. This creates a far more flexible approach to cooking, with the ability to control the 2 hobs and top oven independantly. Due to this setup and the reduction in the amount of cast iron to be heated in the AGA, this AGA heats up far more quickly than the standard electric AGA, from cold to 200C in the top oven in under 1hr 40min. The hobs can go from cold to boiling in just over 10minutes. You specify the temperature for the top oven (as shown on LCD display) and the bottom oven will run approximately 70-80C below this. Both hobs can be set to 7/8 and uses as boiling plates or you can set them so that one is a boiling plate and the other a simmer plate as per the conventional AGA. This AGA is able to adjust to nearly all scenarios, making it an ideal choice for a house where flexibility is key. The AGA requires either 2 dedicated 13amp supplies or one 32amp electric cooker wire but, as with the standard electric AGA, no flue is required. You are also able to install a timer to the AGA so that you can maximise the savings by only having the AGA running when you need it.